Reauthorizing the Export-Import Bank: Instead of killing it, let’s clone it. House Majority Leader Kevin McCarthy leads a phalanx of Republicans taking a firm stance against renewing the Export-Import Bank’s charter. Washington politics may be considerably calmer than in recent summers (remember the crisis and credit downgrade of 2011?). But there remain simmering tensions looking only for an appropriate outlet. Over the past few weeks, the normally quiet Export-Import Bank, whose existence is likely a mystery to the vast majority of citizens, has become that outlet. A phalanx of Republican representatives, led by new House Majority Leader Kevin McCarthy, has taken a firm stance against renewing the bank’s charter. The complaint is that the bank, which provides loans and guarantees to facilitate U.S. exports, is a prime example of crony capitalism and that the government should not be providing these loans in lieu of the free market. The argument, stated somberly during recent hearings and as talking points, was nowhere better spelled out than in a YouTube video titled “The Kronies: Laughing All the Way to the Export-Import Bank.” Other opponents challenge the bank’s contention that it increases exports and supports domestic job creation. It’s an odd target. The Export-Import Bank is one example of channeling a limited amount of government revenue to augment free enterprise. Last year alone, it supported $37 billion in exports. It ends up costing taxpayers nothing, because the fees and interest on the loans it provides end up generating a surplus to the U.S Treasury, which amounted to more than $1 billion last year. Rather than killing it, we should be cloning it. The Roosevelt administration created the Export-Import Bank as part of the New Deal in 1934; the goal was to increase American exports and boost jobs and output during the height of the Great Depression. It assumed an even more prominent role just after the end of World War II to aid American companies in taking an active role in the reconstruction of Western Europe. Its charter has been renewed rather uneventfully over the past eight decades—in fact, an equally partisan Congress did so by an overwhelming margin in 2012. For the most part, the bank provides loans that make it easier for U.S. companies to sell their goods abroad. Usually that entails guarantees, in case a buyer in a foreign country fails to pay or cannot honor its orders. Every big nation, and increasingly most midsized nations as well, have their own version of an export-import bank. While the U.S. Export-Import Bank offered $27 billion in loan guarantees in 2013, countries such as China, Brazil, and Russia as well as other developed nations offered a total of $175 billion, according to statistics released by the bank. Other countries also provide indirect subsidies to the exporters. 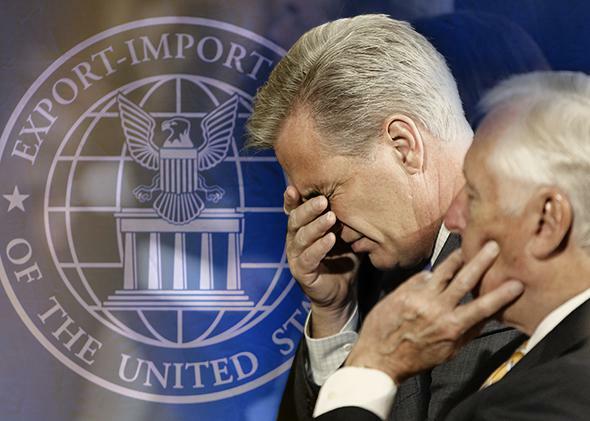 In that respect, the Export-Import Bank is simply an American wing of a global phenomenon. Opponents are quick to point out that in the past few years, the bank has predominantly benefitted a few large corporations, Boeing above all. Helping big business used to be staunchly defended by Republicans in Washington and opposed by liberal Democrats. In recent years, the Tea Party has mostly donned the mantle of populist opposition to those cozy alliances. Yet in the case of Boeing’s commercial airline franchise, the company has only one major international competitor, Airbus. Airbus is an EU consortium that receives substantial backing from multiple European governments, Germany and France especially, and Boeing credibly argues that only with some similar assistance from the U.S. government can it compete in the marketplace. The notion of an immense multinational company such as Boeing receiving taxpayer-guaranteed credit feeds the Republican and Tea Party narrative of a Washington beholden to monied special interests. The brouhaha over the Export-Import renewal has also further opened the fissure between Republicans who are more focused on business than on the populist agenda of the Tea Party. In late June, 41 House Republicans, backed by pro-business lobbying groups such as the U.S. Chamber of Commerce, wrote to House Speaker John Boehner urging a renewal of the charter. And the plethora of Democrats supporting the bank may have also spied an opportunity to recapture the business and Wall Street crowd who have clearly been vacillating in their support. Such are the politics of this debate. Just as important, however, are the economics of it. Given the Tea Party focus on deficits and runaway government spending, the bank makes an odd target, because the bank actually costs the American taxpayer nothing. Yes, it’s true that if the loans go bad, taxpayer money would be used to cover losses. But that hasn’t happened since the late 1980s, when it cost $3 billion—a lot of money, but a pittance in relation to the federal budget. And that was 25 years ago. The default rate is currently at 0.23 percent, which is why the bank has been generating a profit for the U.S. government. Far from adding to government spending, the Export-Import Bank actually helps the deficit and makes money for the American taxpayer. The idea that government programs can enhance the financial health of the commons is an alien one in our current climate, in which government is perceived purely as an expense. You would think that those who believe government should be run more like a business would celebrate a multi-billion government program that supports American manufacturing and bolsters thousands of small businesses along with the behemoths such as Boeing, all the while garnering a profit. What, exactly, is wrong with that picture? The Export-Import Bank is a rare American example of a government program that provides a vital spur to private investment that serves the public good. Canada has been much more aggressive in implementing such models. The Canadian government has developed a wide variety of public-private partnerships, where government underwrites the initial and often riskiest tranche of capital that banks may be reluctant to fund. In the U.S., the proposed infrastructure bank, which has been part of the un-enacted Obama agenda, takes a similar approach to funding infrastructure. Rather than command and control government spending—which does indeed cost taxpayers hundreds of billions of dollars—these initiatives use a relatively modest outlay of government-backed loans to unlock hundreds of billions in capital spending by companies and loans by banks. These approaches have allowed Canada to upgrade public infrastructure at less cost and in less time. What follows, then, is that rather than killing the Export-Import Bank, we ought to use it as the inspiration for multiple other programs. Why spend hundreds of billions in subsidies and direct spending and hiring when we could instead use government as a guarantor that unlocks the free market? The Small Business Administration is a parallel example, helping new businesses get loans, but it could be dramatically expanded. Instead of spending hundreds of billions in highway bills, we could create a public-private road agency. Every agency, from the Veterans Administration to Health and Human Services, could be tasked with finding areas where private companies can serve the public good if they are simply given some basic backstops that give them access to needed capital. Government would still foot the direct bill for much of the commons, from national defense to the justice system, from public education to aspects of health care and elderly care. But the model of the bank suggests that there are ways to deliver public goods more efficiently and a much lower cost. The current fight over the Export-Import Bank is illuminating not because of a cohort of Republicans is trying to kill it off, but because we should be looking to it as a model. The problem with the bank isn’t that it exists; it’s that so many more things like it do not.